This is one of those yarns I buy on impulse because it is so soft, but I have no idea what I’m going to do with it. I’ve had this yarn for a few years, I think. Finally, I realized that I am never going to knit a garment in something so fluffy, and I have way too many scarves, already, so I knit up what happened to be on the yarn band – a pillow. It’s a fun, quick, and easy pattern. The pattern calls for it to be knit in two pieces, but I knit half in the cable pattern, then switched to the alternating garter stitch for the other half – only had two sides to stitch up (plus the flange end). This was the pattern that distracted me from the Tranquility afghan. I actually like how it turned out. Cables on the front, 3-row garter on the back. 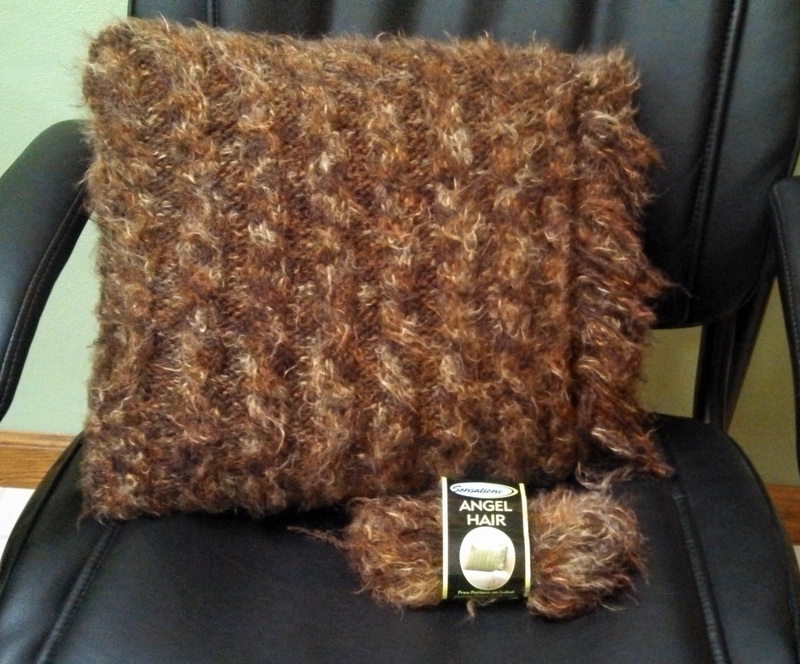 Yarn is Sensations “Angel Hair” in Dark Brown by JoAnn’s. Pattern is Cable Knit Pillow, also by JoAnn’s. Now that I’ve completed one, I will probably do one for each of the teenage kids, who like the softness.